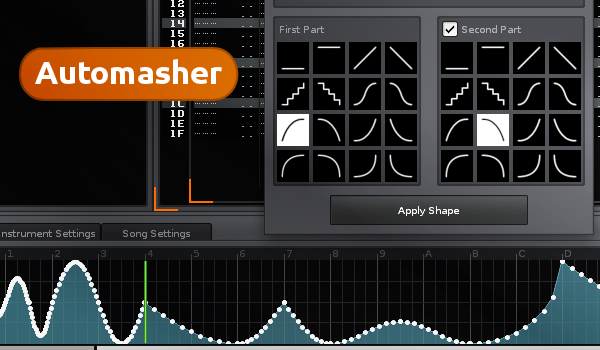 Automasher is a tool to create complex automation curves. It works by assembling basic shapes, which you can combine using flexible parameters. There's also an option to make the curve match the notes in the corresponding track. Simple Waves: a curve made of one simple shape, optionally repeated over the selected zone. Alternating Waves: the same thing but with two alternating shapes. Trigger on Note (Constant Length): a curve with one peak for each note in the track. Trigger on Note (Scale with Note Duration): the same thing but the shapes scale from note-on to note-off. The next section let you choose a selection method. The first option uses the cursor position (in the pattern editor) and a user specified length. The second option works with whole patterns, starting at the current one. Finally, the last option works with the whole song. Length (or Patterns): Total length of the curve. Shapes: Number of "waves" the curve will contain. Offset: Move the curve by a fraction of a line. Phase: Phase offset (to inverse phase, set it to 0.5). Points / Line: Resolution, i.e. number of automation points per line. Auto-update: Write the curve as soon as you change one of the settings. Be careful with this option: it's only usable for short curves, for longer ones this will introduce a lot of lag in the controls. Base: The value at which the curve will start. Peak: The value the curve will reach at its peak (can be below origin to create inversed shapes). Step to: If you want the curve peaks to step up or down at each iteration, enable this and set the destination value for the last peak. Random: If set, the curve peaks will be randomly chosen between the two values. While the tool window is focused, you can use the Up and Down arrows on your keyboard to move the cursor. You can also press Control+Z to undo your changes. You can create sinusoids or similar curves by selecting an origin of 0.5, a peak value of 1 and an alternate peak of 0.